Trimming dog nails is a necessary requirement in pet ownership and sending your dog off to get this done by a professional can be both expensive and time-consuming. 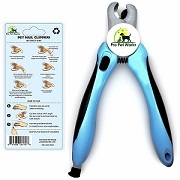 For those looking to do it yourself, we have provided the largest list of dog nail clippers reviews anywhere on the internet. 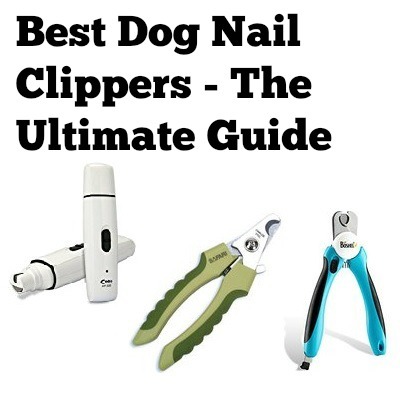 By following our guide, you will find the best dog nail clippers for you. In this review, we list all of the top dog nail clipper companies and break down our top picks based off of 5 metrics: Trimming Performance, Ease of Use, Build Quality, Price, and Overall Rating. We also discuss the different types of dog nail clipper types as well as the difference between manual and electric dog nail clippers. For your convenience, we have listed the top picks in the table below. To read the more thorough review of each product, just hop right under the table. There are tons of brands that offer dog nail clippers. It can be very overwhelming trying to search for the best ones for you. We have done the dirty work for you and included many of the top brands below. Simply click on any of the brands and it will jump down to our full review. Alfie Pet is actually made by a company called Petoga Couture. They have a variety of pet products as well as a couple of varieties of nail clippers. All of their nail clippers are manual and they come in both scissor and guillotine models. Prices are reasonable and the focus on their simplicity over elaborate features and designs. 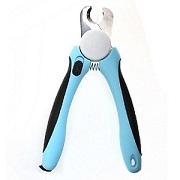 Alkem dog nail clippers focus on a similar design across all sizes and shapes of clippers that they sell. Specifically, they utilize the traditional scissor model. They try to find a combination of comfort and usability while still being reasonably priced for most people. Ancol is a British company that has a variety of pet products. 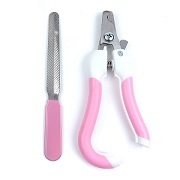 In regards to dog nail clippers, they offer up both scissor as well as guillotine nail clippers in both small and large sizes and that are all manually controlled. Their products are extremely simple, low-cost, and all are based on similar design ideas and approaches. Andis is a company that focuses primarily on pet grooming for cats and dogs. They not only have various dog clippers but even clipper kits that are designed for commercial applications. Their clipper selection includes scissor-type clippers as well as an electric nail grinder. Material and build quality are bumped up a notch but it does come at a higher asking price. Aspen Pet is a division of Petmate which is an established pet brand that deals primarily in cat and dog products. Specifically, they have scissor and guillotine-style manual clippers under the Aspen Pet name. Quality is much better than what you’ll find in more affordable brands but you are obviously paying an upcharge for it. 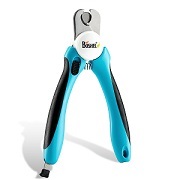 Bengoo imports a huge array of dog-related products including various types and sizes of dog nail clippers. These include manual scissor style as well as a couple of different kinds of electric grinder style. Prices are very reasonable but you will have to deal with the same issue of uncertainty and some quality shortcuts that you do with other imported brands. Boshel dog nail clippers appear to be budget models that are imported from manufacturers from Asia and try to find a happy medium between low cost and decent performance. Selections are rather limited, consisting of a single type of the ever-popular scissor-style. There are great similarities between this model and many others that we have reviewed and the fact that this is one of the best-selling models on Amazon likely is attributed to proper marketing rather than having a vastly superior product. Chinatera is a brand that sells a variety of cheap, Chinese-based products that emboss very low prices but also sometimes questionable quality. They offer up a few different sizes of dog nail clippers that all come in a standard scissor style. CLAS sells various products and utilizes the Chinese importation approach that a lot of the other brands on here do as well in regards to dog clippers. Because of this, the CLAS dog nail clippers are simple and affordable but leave some things on the table in regards to performance and lasting ability. You only have one product to really choose from and it is the popular scissor layout. ClothingTalks is another brand that has a huge range of products that fall outside of pet products but they do have some types of dog nail clippers so they are worth mentioning. They stick to a very straightforward design and go with low-cost materials and construction so as to be able to offer a very low-cost product. Product selection is just limited to a few sizes of scissor-type nail clippers. 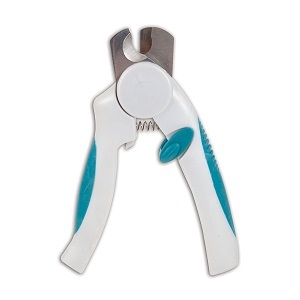 Coastal Pet nail trimmers are a rather diverse collection that has a few different tiers. The layouts of their nail trimmers include scissor-type in varying sizes and styles and guillotine-style in a couple of different styles. They are not the cheapest but try to offer up a product that is a bump up in regards to performance and usability over the more cheaper options out there. Codos is one of the most unique nail clipper brands we have come across. While most of its competition focuses on manual scissor and guillotine-type clippers, Codos instead focuses on electric grinders that are intended for more demanding applications. There is basically one size and power output to choose from and they come in both corded and cordless variations. As expected, they are among the most expensive dog nail clippers you will come across. Conair has a pet division that makes all sorts of grooming products for dogs. Included in this is their lineup of dog nail clippers. Specifically, they have options in scissor and grinder format. Asking prices are actually not bad, even for the grinder (which usually fetch a huge premium). Conair believes that, despite their good sale prices, they are able to offer a product that will meet your dog nail needs. DCOU dog nail clippers are another budget offering but they do try to stand out with their rather unique handle and blade shape. Like most, they stick to the tried and tested scissor-style clippers. They come in solidly in the budget-priced tier and hope that their specialized design will make them stand out from their competition. Dele is another brand that offers up a lot of low-cost and relatively low-quality products that are manufactured in China and similar areas. Their offering in regards to dog nail clippers revolves around a couple different types of scissor-type manual examples. They are at a very attractive price point and even come with a nail file accessory. But the low price does mean you have to watch out for questionable performance. Ecloud Shop has an interesting name that doesn’t elicit thoughts of animals to most, but they have a surprisingly large selection of dog nail clippers to choose from. Their products span between all three primary categories including scissor-type, guillotine-type, and even electrical grinders. Their prices are very reasonable and, while they don’t do anything groundbreaking, they hope their diverse selection will attract an audience. Four Paws is a brand that has a huge range of pet supplies for dogs and cats. 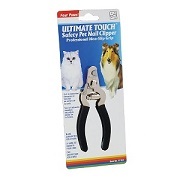 In regards to Four Paws nail clippers, they have a few to choose from of various sizes and configurations. They focus on manual scissor and guillotine-style clippers and, while they are a bit higher in price, Four Paws feels that their increase in quality and their established name in the pet world justifies it. Gonicc is another somewhat unknown in the pet world as their products vary greatly among many different industries. However, they do offer a rather popular nail trimmer that they have designed and priced to try to compete with other mid to upper-range products on the market. Selection is limited to this manual, scissor-style trimmer. Most people have never heard of GVESS (ourselves included) but after some research, they appear to be another brand that specializes in importing budget items primarily made from China and relabeling them. Their sole dog nail trimmer is a low-cost manual scissor-style that closely resembles many other products on the market. IHP stands for Inter House Product and they are a brand that imports a large number of products. While there are plenty of other brands that do this same thing, IHP actually has a rather large and diverse selection of dog nail clippers which is a bit of a rarity of these type of companies. Specifically, they have scissor-style, guillotine-style, and even grinder-style dog nail clippers in various shapes, sizes, and color schemes. JW Pet is a pet specialty company that is owned by Petmate. They have a huge selection of products and specifically, their trimmers and clippers are quite diverse as well. They have scissor-style and guillotine-style manual nail clippers. And, while their prices aren’t the cheapest, JW Pet believes that their superior performance justifies it. Kamoltech dog nail clippers are comprised of a couple of scissor-style trimmers that come in standard and popular sizes. Both utilize materials and shapes that have become sort of the standard clipper dimensions that we see being imported. The major issue is that the great price that we are used to seeing with this approach isn’t present here. Koodella is a smaller company that offers up a few grooming and trimming-related products for cats and dogs. While they don’t have a huge impact outside of Amazon, their dog clippers are one of the best-selling pairs found on Amazon so they were worth checking out. Specifically, the only have one type of dog nail clippers and it is the standard symmetrical manual scissor style. It is also a bit more expensive than many other similar products on the market but Koodella hopes its reputation and added performance will justify it. As their name suggests, Master Grooming Tools focuses on a range of grooming products for dogs and cats. 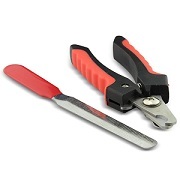 Within their dog nail clippers, they have a huge selection of nail clippers and grinders in scissor-style, guillotine-style, and even electric grinders. They tend to be on the most expensive end of the spectrum but their proven track record and experience in dog grooming products is to thank for that. Millers Forge is one of the most recognized brands in dog grooming products out there, and their huge selection of various types of dog nail clippers reflects that. 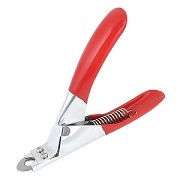 They have a huge range of sizes of scissor-style and guillotine-style nail clippers in various shapes and sizes. Their asking prices are in the mid-range and for that, they promise up great performance and durability. Miracle Corp is a large company that has a very wide range of animal products, particularly for horses. However, it is a child company called Miracle Care that offers up various dog nail clippers. They have a few different options of guillotine-style clippers as well as scissor-style clippers, with their premiere products falling under the QuickFinder line. What makes their products truly stand out are that they have technology in place that detects and notifies you when the nail is in an optimal location to clip. The products have a unique approach but they are also very expensive. Odontomed2011 is one of the most diverse companies we are checking out, as they make all sorts of instruments including dental, surgical, veterinary, beauty, and more. They specialize in making a tool for just about every job imaginable and take pride in their very sharp and precise tools. 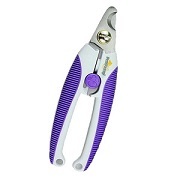 The focus just on manual scissor clippers and they do come at a relatively high price tag. Oster is one of the most recognized and established names in pet care, being a leading producer in the field for many years. 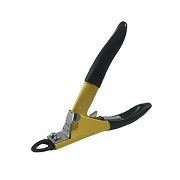 They have a diverse selection of dog nail clippers that range from manual scissor and guillotine-style clippers up to their high-end electric nail grinders. The promise great performance and convenience that can be attributed to their decades of knowledge but it can come at an above average asking price. Pedi Paws focuses exclusively on electric nail grinders which make it rather unique since most companies opt for dealing only in manual clippers of a combination of them. 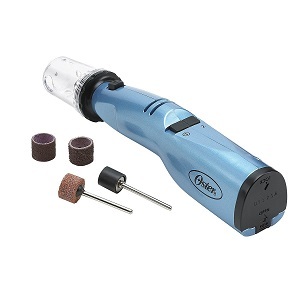 Their product is also significantly cheaper than a lot of the other electric nail grinders on the market. This typically means that there have to be some sacrifices made in the quality or performance department but Pedi Paws believes that they find a happy balance between the two ideals. PepPet is another unique brand in that it only deals with electric nail grinders. In addition, it tries to price these grinders at a price point that makes them within budget for just about everybody. Rather than go for outright maximum performance, PepPet nail grinders instead opt to sell something that gets the job while being as quiet and vibration-free as possible. Probably the coolest selling point with their product is that it also doubles as a hair trimmer (think of how a Dremel has multiple attachments). Pro Pet Works is a small brand that focuses primarily on manual scissor-style clippers and it essentially revolves around the ever-popular symmetrical style. In fact, the specific model that they boast (and that is one of the top sellers on Amazon) is extremely identical in appearance to many other import brands that we have already discussed on here except for a noticeably higher asking price. QINF is yet another brand that imports generic dog nail clippers and puts their label on it. You will immediately recognize the shapes and features that their products have if you do much research into the best dog nail clippers. That being said, they do have a rather wide range of types to choose from including various sizes of scissor and guillotine style. However, their prices are a bit higher than many of the other brands selling similar products. Resco has been in the pet business for over 80 years so they know what they are doing. In fact, they exclaim that they are the originators of the guillotine-style dog nail clippers. 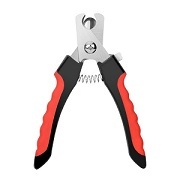 Along with this, they have a scissor style as well (or more accurately, they called it a “plier-style”). Being in the business for as long as they have, Resco has a good idea of what is necessary to make a good pair of dog nail clippers. But they certainly aren’t cheap. Toogoo(R) has a very interesting name but they have had a presence in the online world for quite a while. Similar to other brands we have discussed, their specialty is to offer up a huge range of low-cost, imported products with low prices being the top consideration. They have a range of scissor type and guillotine type dog nail clippers. Uxcell sells a huge range of products ranging from clothing to put supplies to sporting goods. Their approach seems to be importing Chinese manufactured products and flipping them for very low prices. 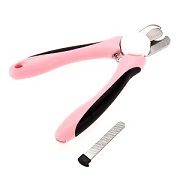 Their quality can be questionable but we can’t deny their huge range of dog nail clippers (that include both manual scissor type and guillotine type) as well as their very competitive asking price. Wahl is known for their array of home products. Specifically, they have a subset of their company dedicated specifically to pet-related items including a diverse selection of clippers, trimmers, brushes, and shampoos. Part of this collection is their diverse group of dog nail clippers that include manual scissors and guillotine clippers as well as electric grinders. Asking prices tend to meander toward the higher end which Wahl feels its reputation justifies. In determining what the best dog nail clippers are, we have put together an extensive list of considerations that we reviewed and ranked for each product. We break down each in detail below. This metric goes over how well the particular pair of dog nail clippers does at its intended purpose: trimming nails! There is actually a very wide range on trimming performance from one product to the next. Many variables can affect this. Examples of variables include the quality/material of the cutting blade, the length and shape of the handles, performance features added to the clippers, and much more. Not all dog nail clippers are made the same and one area that this really shows up at is how easy they are to use. A lower quality pair without helpful features can be very difficult to use and will make the experience of trimming nails a nightmare for both you and your dog. We look for helpful features such as proper grips, impact springs, nail guards, powerful motors (for electric models), and more. This metric refers to the level of craftsmanship and material used to construct the product. A pair of nail clippers that is poorly constructed or that is using subpar materials will fall apart much sooner than a pair that spends a bit extra in resources and time to create something of much higher quality. We like seeing metal components being used over plastic, high-quality hardware to attach the handles to the blade, quality blade material, and much more. Some people might not put much consideration into the appearance of their dog nail clippers but we still felt that it was worth including this metric. Obviously, looks are quite subjective so really we are after products that have a variety of shapes and colors to choose from, that give off an appearance of being high quality, and that break away from the convention designs that saturate the dog nail clipper market. While even the most expensive pair of dog nail clippers is by no means a bank-buster, there is still a somewhat wide gap between the budget lines and the premium lines. And for those on a very tight budget, every dollar counts. Just because a particular model is cheaper doesn’t automatically mean it gets a better score here. Rather, we compare the price to what type of features and performance are offered and then compare it to what else is out there to come up with a score. This rating takes into consideration all of the factors above and brings us to an overall rating. Generally, we feel that a rating of 3 stars or higher means it is an acceptable purchase with 4 stars and above being great buys. 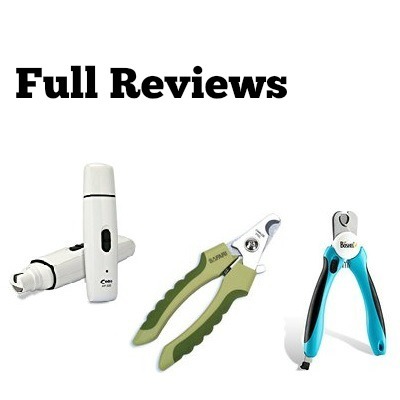 These are the full reviews we have performed for each pair of dog nail clippers. 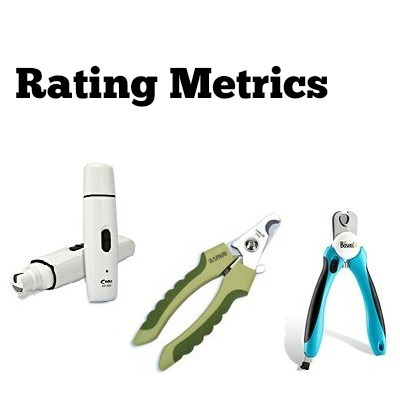 These reviews break down the individual metrics and help us arrive at our list of the best dog nail clippers. The trimming performance on these is about average. We have found that the guillotine model is a bit better at cutting nails but will obviously be limited by size restraints. The scissor style, while capable of cutting large ranges of dog nail sizes, doesn’t have quite the “bite” and you will need to make sure that you are firm in your hand motion to ensure a clean cut. The guillotine style and the Devin model have an acceptably long handle that makes it easy to create enough power but we do wish that the Ariel Nail trimmer (the smaller scissor model) had a bit longer handles. The rubber and gel grip handles that are used are comfortable and ensure a nice, secure grip. As mentioned above, you should have no difficulty in operating the Devin’s 6.25” handle and the guillotine’s 5.5” handle but the Ariel may be a bit small for some. You may also find some difficulty on larger dogs who have thick nails as they may simply not fit within the blades in the proper manner. There are some major quality issues associated with these products. Specifically, they revolve around the handle and the plastic pivot. Both are susceptible to breaking very early on which makes the dog clippers essentially useless. The blades themselves are of acceptable quality (quality stainless steel) and should hold up to standard wear and tear but the weak handles are a major concern. These are rather cheap products and they appear so in the styling. They are made almost completely of rather thin plastic that doesn’t give off the vibe of being high-quality or long-lasting. We do like the colorful shell that comes in a few varieties of color schemes depending on which model you go with and the stainless steel blades do emboss a level of acceptable aesthetic but we do wish that they would beef up the handles some both from a functional as well as looks standpoint. These are definitely affordable products and should be within anybody’s price range. There are definitely some shortcuts to achieve this price point (as mentioned above) but that is the price you sometimes pay for a low asking price. And we are OK with that. Alfie Pet dog nail clippers by Petoga Couture are one of many offerings in the budget lineup that try to find the happy medium between functionality and low costs. We do like the stainless steel blades that are used but the handles leave much to be desired and are prone to breaking very early on. You may also struggle some using the smaller models but the larger ones should provide adequate grip to properly use them. We can’t be too picky considering the great price but do wish that Alfie Pet would improve some of their design approaches. These trimmers perform about as expected given the price. 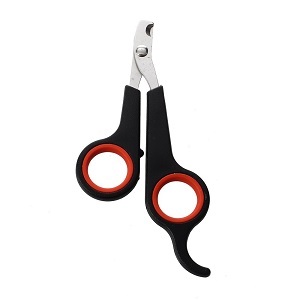 They utilize the standard and popular scissor configuration. This makes them applicable for a wider range of shapes and sizes of nails but they don’t have quite the slicing power of guillotine and of course grinder models. The blades that are used are of average quality and should stay sharp for an acceptable period of time. We do like that there are small, medium, and large sizes for pets of varying size. Specifically, the blades and handles are adjusted to allow for a larger bite and longer handles for control, as necessary. 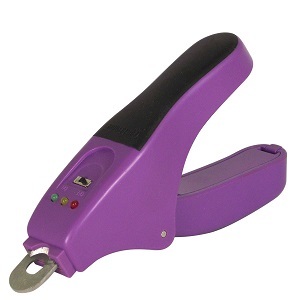 We really enjoy the easy grip handles on Alkem dog nail clippers. They are comfortable to hold and help to ensure that you have full control while using. There are quite a few handle lengths and shapes that vary on whether you have a small, medium, or large dog. They also have other shapes for other types of animals as well. Overall, they do a very good job of shaping and sizing them to be both ergonomic and easy to use. This makes trimming nails a much simpler task. Despite being a budget line, these are actually of relatively high quality. The handles, while plastic, are rather thick and the hardware used to attach both of the pieces are of acceptable size and quality. The handles should hold up to most wear and tear. The one minor weak point is in the blades which will get dull over time and require being resharpened in order to function at their prime. The biggest variance between the different shapes and sizes of Alkem dog nail clippers come in their handle pad design. You can choose between solid ridges, a combination of ridges and bumps, and simply bumps. This not only helps in the comfort aspect but also gives some variety in styling. There are also a few different color schemes to choose from which, from what we can tell, coincide with which size you decide to purchase. The asking price of these nail clippers is budget to average and should be within most people’s price point. For the asking price, you do get a pair of clippers that are made with decent materials and we can’t really find any major shortcuts on construction. Alkem dog nail clippers check off most of what we look for in a quality product. The performance is adequate and the comfort and ease of use are above average compared to what else is out there. And all of this comes at an asking price that we are very happy with. We do wish there was more variety to the types of clippers that they have but for those after a traditional scissor-type pair then Alkem should meet your needs. Ancol dog nail clippers utilize stainless steel cutting blades which should stay relatively sharp and allow for easy cutting. We like that there are both small and large sizes in their scissor nail trimmers as the small size really is way too small for many medium and large dogs. Their guillotine suffers a similar issue but for those dogs who can fit their nails in it, you will enjoy effective trimming that is a breeze. The handles overall are a bit on the small side, however, which means you will have to put more force into each pass to get the equivalent trimming power as a similar trimmer with longer blades. Ancol seems to take pride in making a very simple product that is easy to use. You won’t find a lot of features or fancy additions to their trimmers. This makes them simple to use and something that just about anybody could pick up and easily understand how to navigate. As mentioned above, the blades are of respectable sharpness but you may have to squeeze a little bit harder than you would expect thanks to the smaller than average handle length. One of the benefits of having a very simple trimmer is that there aren’t a lot of parts that can break. This is the case here and you shouldn’t have to worry about any major quality issues. The plastic that is used is of adequate thickness and the bolt that holds the pieces in place is strong enough to handle the force that naturally occurs while using the trimmers. There is a very standard design that Ancol goes with. Not only is this reflective in their shapes but also in the color, which is a sky blue and silver accent scheme. This straightforward approach is extremely noticeable in their guillotine nail clippers which have about as simple of a design as you can get. For those who are overly concerned with aesthetics you may be a bit underwhelmed by the design but for most everyone else it should be fine. The Ancol Ergo dog nail clippers are budget to mid-priced. While there are more affordable products on the market, these aren’t so expensive as to scare off most people. And the build quality and materials used are acceptable for the asking price. Ancol nail clippers are very straightforward and simple in their application and design. While simple, they take advantage of components that are of acceptable quality and their basic construction means that there aren’t a lot of areas where things could break or go wrong. You also have a bit of variety in regards to both type (scissor and guillotine) as well as the size (small and large). Andis dog nail clippers have really figured out what is necessary to make the performance great. The blades they use in their manual clippers are made of heat treated stainless steel that ensure a sharp edge that will last. The handle is also plenty long to allow for great lever action and control. Their electric nail grinder comes in 2-speeds and utilizes a sandpaper-like cylinder on its rotating head to grind nails down. The grinder is great for rounding off sharp points and to even do the initial cutting on smaller pets (particularly ones who aren’t freaked out by the loud motor noise). No matter if you go with a manual scissor trimmer or the grinder, both products are very user-friendly. 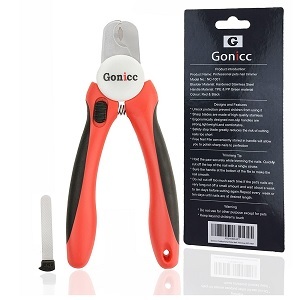 The scissors have anti-slip and easy-grip handles that are comfortable to use and help to maximize user control. The handles are also spring-loaded which takes some of the impacts off of opening and closing the trimmers which reduce hand fatigue. In addition, there is a safety stop that prevents overcutting as well as a safety lock that you can switch on when not in use. The grinder has a silicone sleeve and ergonomic design that makes it effortless to hold and allows for better control. There are no shortcuts taken anywhere in the construction of these dog nail clippers. The parts and components used are high quality, from the stainless steel blades to the thick and durable plastic and rubber used in the handles. A common complaint with other brands is that, over time, handles tend to break or warp while being used but you don’t have to worry about this with Andis. Their grinder is also of high quality and the motor is designed to last for many cycles without concern. There is essentially one design for the nail clippers no matter if you go with large or small. We actually prefer the styling of the non-premium model and its serrated green rubber grips over the more mundane (but professional) black and silver appearance of the premium line. The grinder is shaped essentially as a simple cylinder and comes in a deep purple color. You do pay for quality here, and the asking price is a bit higher than some of the other brands we have reviewed. This is obviously the case for the Andis electric nail grinder as it is several factors more expensive than manuals (but this is to be expected). While the asking price is a little higher, the performance and build quality more than justifies it. Andis dog nail clippers really impress us just about every facet. The performance is great and long-lasting, the build quality is top-notch, and they are very simple to use even in busy settings with multiple dogs. The styling is a bit modest on some of the models and the asking price is a little higher than some may like but we feel it is more than worth it for something that should last for a long period of time. Trimming performance is fine but there are some issues with sizing. There have been a lot of complaints about the blades struggling to handle smaller animals so you might want to avoid these if you have a small dog. However, for those with medium to large size dogs you will enjoy a nice blade that should stay sharp for a while. The handle is a bit bulky but all but those with the smallest hands should be able to handle it. The handle issue above is worth mentioning but since it is made of plastic it is on the lightweight side. The impact spring is plenty large and cushioned, non-slip handle is comfortable to hold and allows for nice control. Despite being made of a lot of plastic, build quality is actually quite nice. We have seen a lot of variance in the fit and finish of plastic components on other brands but Aspen Pet seems to have got it figured out as the parts come together quite nicely. There is only one color layout to choose from but it does come in some rather refreshing designs. Aspen Pet dog nail clippers are on the larger side which may be a positive or negative in the looks department depending on who you ask. For those with large hands, it may be a welcome surprise. Asking prices tend to be in the mid to premium range which is the norm of Petmate products. You do get a more established brand name that has a lot more experience with animal products than a lot of other brands we have discussed. This by itself might justify the higher charge. Beyond that, you do get a product that is put together well. Aspen Pet dog nail clippers play a very straightforward and conservative approach. While some people might not appreciate the bulky plastic components, for those who can comfortably handle the size and also have a large enough dog, you will enjoy acceptable performance and features. Trimming ability is hit or miss on these and it really boils down to what batch of products they are delivering on that particular day. There is a bit of variance with the quality of the blade, both in regards to the material as well as how it is machined. Because of this, you may have a particular pair that works very well and then someone else with the same pair struggles to get good performance. Also, the motors in the electric grinders could use a bit more power. The handles are pretty consistent, however, and are of acceptable length for most people’s needs. These products have lock mechanisms, cut shields, impact springs, and ergonomic grip handles so on paper they meet most people’s needs. They are definitely comfortable to use, assuming you get a pair that has the blade issue in order. We do wish that they would have beefed up the components, though, as some are a bit on the cheap side. As you have probably suspected from now by reading our other reviews, there are some notable quality issues that are worth bringing up. Besides that blade issue mentioned above, most of the components appear to have been made in a rather cheap manner which means that they can crack and warp much sooner than you would have hoped. If Bengoo would just beef up some of the components they would have a much better and longer-lasting product. Since Bengoo nail clippers do span a variety of products you do have a nice selection in regards to aesthetics. That being said, all of the designs are very standard and if you spend more than 5 minutes shopping around you have likely seen all of the designs and color schemes. Prices are reasonable and tend to hover in the budget to mid-range price tier. There are plenty of options in this price range so it really boils down to personal taste. Bengoo dog nail clippers have an acceptable range of products to choose from but suffer from some inconsistency issues that can affect both performance and life expectancy. They have plenty of helpful features but how well they work for you really comes down to a case by case basis and if you happen to be lucky enough to get a pair that are within design parameters. For Harris’ solar pool covers, there are several different options to choose from ranging from their 50/50 blue clear hybrid material up to their 100% blue. This refers to the range of light that is allowed to pass through the material. They do have some pre-made sizes (mostly rectangular) but are really lacking overall in what sizes are available. For many people, you would have to go a custom route and see if someone could make a custom cover out of this unique material. As for the standard mesh, it comes in three tiers starting with their sovereign line and ending with their premium emperor criss-cross line. The handles are easy to grip and minimize the likelihood of slipping which helps with control. There is also a safety stop blade that helps to minimize the chance of an overcut. The impact spring, while present, is a bit on the small side but it does a good enough job of absorbing force to assist in making it easier on your hands and wrists. Similar to a lot of imported nail clippers, build quality can be hit or miss but Boshel has seemed to have a good grasp of this and apparently has a good supplier as there are relatively few complaints about their products. That being said, you would find quite the quality and craftsmanship you see in higher-end, metal clippers. But it isn’t terrible. This is a very played out and conventional design. In fact, you can probably find a dozen or more of other brands that have not only imported the same design but even the same color! Speaking of the color, it comes in a bright blue and black color scheme with Boshel’s emblem printed near the blades. While these clippers are similar to many other budget-oriented products, they are actually somewhat more expensive. Our best guess as to why is because Boshel has such a high reputation online and is one of the top sellers on Amazon. Because of this, they can likely fetch a higher asking price since they have very good reviews. In the busy world of imported dog nail clippers, Boshel uses an established approach that isn’t the force and likely won’t be the last. However, they have found an approach that works. Their quality is plenty acceptable and their performance, while not groundbreaking, does a serviceable enough job to make most happy. Prices are a bit higher than elsewhere but this is likely attributed to their sterling reputation online. We are rather disappointed with the overall trimming ability with these. The blades are made of what appears to be rather low-quality metal that is also a bit on the thin side. In addition, even on the larger sizes, the handles are somewhat small which means you have to squeeze harder to ensure a clean cut. The fact that they don’t have any other product formats such as guillotine or grinders is rather underwhelming as well. We do appreciate Chinatera included a spring that helps to absorb some of the impacts but it is cheap and small and doesn’t do nearly as good of a job as many other models. In addition, the handles are not very comfortable and the rubber grips are rather hard and slick. Couple this with the fact that the handles are not very large means that you may find the grip and trying to handle these to be rather uncomfortable. These are budget dog nail trimmers and it shows. They are very lightweight and you can tell that cheap material was used in the construction of them. Repeated use makes them very prone to having cracked or broken handles. In addition, the relatively cheap metal used is easy chipped and wore to a dull finish in no time. There are a few different color schemes to choose from including black on red, pink on black, and silver on black, but all have a similar shape. The only other major variance is between the wavy serrations on some compared to the smooth handles on others. While they look pretty normal, upon closer inspection you will be able to instantly tell that they don’t convey the quality of other more expensive brands on the market. The biggest selling point with Chinatera dog nail clippers is in the price. These are among the most affordable units on the market and will be easily within anybody’s pet budget. However, as mentioned above, you have to give up quite a few features and make some serious sacrifices to achieve such a low price point. Really the only thing that Chinatera dog nail clippers do well is in their asking price. Beyond that, you can expect lackluster performance, uncomfortable handling, and short life span. We appreciate saving money just as much as the next person but in this case, we would encourage you to spend a bit more for something that works a lot better. While stainless steel is used for blade material, it doesn’t feel to have as high quality as other brands who boast stainless steel blades. Perhaps it has to do with the heat treating (or lack thereof) that was performed. The handle is average length so it should be long enough for most people so as to not struggle with operating. Yes, these do come with a spring in between the handles like we like to see but it is so small and flimsy it is hardly noticeable. The handles, while adequately long, lack some in the grip department and the hard plastic becomes slick when wet. There is also a bit of limitation in regards to the nail size you can use. This normally isn’t as severe for scissor-style products and are more of an issue with guillotine-style dog nail clippers but due to the design of the blades, it is worth mentioning here as well. You can tell that this is a budget Chinese knock-off as the parts just feel lighter and weaker. As mentioned above, the blades will dull sooner than you would like and the weak spring won’t last long, either. But hey, you get what you pay for. Standard looks that don’t really try to push the envelope. In fact, you don’t even get to enjoy the way blades or a more progressive blade design. Your color layout is restricted to a red and black pattern. CLAS dog nail clippers are, as expected, extremely affordable. For the price, they are fine in the short term but the sacrifices in material and construction will rear its ugly head soon after. There are many budget-oriented dog nail clippers on the market that proudly boast great sale prices but miss the mark in long-term performance. Honestly, compared to the rest, CLAS actually offers up something towards the top but we feel that you are better off spending just a few more dollars and getting something that is easier to use and will last a much longer period of time. Similar to many other budget-oriented brands, these sacrifice performance for low prices. The blades are not very high quality and the metal that they use dulls very quickly and easily. The handles are of acceptable length but the fact that you will have to constantly worry about resharpening the blades after just a few uses really turn us off. We like that an impact spring of acceptable size is used which helps to reduce some strain on your hands while using. The grips, however, leave a lot to be desired and don’t do a very good job of making you feel like you have a nice grasp, particularly if there is any moisture on them. And the fact that after a short period of time you will have to deal with a dull blade face makes these not the most user-friendly products around. The materials and construction are a bit on the low side and you may experience premature cracking or breaking of the handles. We have made it very clear already that we aren’t huge fans of the blades but it is worth mentioning again. For the low price, you can’t be overly picky but the shortcuts in materials and construction really show here. There is actually a pretty nice array of color schemes to choose from. Variations including blue/black, pink/purple, black/silver, and more are available. Beyond this, you will find the tried and tested handle design with optional curvy or straight grips. ClothingTalks dog clippers are very reasonably priced and will be some of the most affordable you come across. 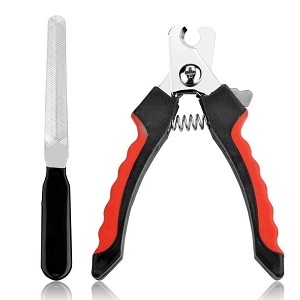 While we do appreciate the great asking price for these nail clippers, you simply sacrifice too much in regards to performance, life expectancy, and user control to make these a strong recommendation. It is nice to have some various color options to choose from but we value performance and usage over this and for this reason, we would encourage you to look at some other models. All models of Costal Pet nail trimmers take advantage of heat treated stainless steel. After careful observation, we have found that the steel they use is a notch up in quality and should stay sharper and last longer than a lot of other brands’ stainless steel. This is particularly true in their Evolution professional models. The blades are also on the larger side which makes them more applicable to a wider range of dog sizes. The blades are quite long and in some cases such as in the Evolution and Safari lineups, have special handles that vary in individual length and are optimized to get a strong and controlled grip for better performance. The handles on all of Coastal Pet’s trimmers are great and do a good job of allowing for a comfortable but firm grip. You have to choose between both wavy handles and straight handles for personal preference. As mentioned above, we also really like the specialty handles that are better-shaped for your thumb and pointer finger to have their own fastener. The largest units have an impact spring that takes the load off some during use but this is missing in the smaller sizes (which we wish included them as well). The extra expenses definitely pay off here. All of the components are nicely manufactured and just holding the product you can get a sense that it will last for a long period of time. The blade alone is worth the price of admission as it is oversized and thick enough for most people’s likings. All of this is multiplied in the professional models that are designed for commercial applications so you know that they can stand up to a lot of operation. There are multiple styles to choose from so just about everybody will find something that aligns with their aesthetic needs. Depending on which “tier” you go with, you will enjoy a specific color scheme: neon and silver for the Safari lineup, neon and purple for the Li’l pals lineup, and navy and gray for the Evolution lineup. These definitely aren’t the cheapest nail clippers on the market but they are still reasonably priced enough to be within reach for just about everybody. And for the small increase in price, you see a big increase in quality. Coastal Pet nail clippers have found a happy medium between quality, performance, and price that really sits well with us. You have plenty of choices in regards to size and features and we like that you can choose between multiple clipper types (scissors and guillotines). They are also comfortable to use. These get two thumbs up in our book. Electric trimmers treat nails by grinding them down rather than cutting them off, so it may take a bit longer to finish but you do have more control. These are also great for rounding edges. The other huge benefit is that they are extremely versatile in the size and shapes of dog nails that they can handle. The grinding element used actually has diamond bits in its stone so you know that it is incredibly sharp and should last for long periods of time. Probably the biggest selling points of electric dog clippers are in their ease of us. Rather than trying to line up and snip nails, you simply lay them against the grindstone and let it work its magic. This takes the somewhat laborious snipping motion you are forced to do with manual clippers. The motor used here is reasonably quiet and should be able to be used without spooking most dogs. The only thing we wish that these units had was a better grip surface that was made out of rubber to ensure an even better grip. With electric trimmers, you are having to work with more parts, some of which are moving, so having something that is of good build quality is very important. As mentioned above, the grind element is of great quality and should last for a long period of time. The shaft is made of brass and should also hold up to wear and tear. The motor is a high-power mute motor that is designed for extremely low operating time. Being an electric unit, however, you will need to be more cautious around moisture, dropping it, etc. as it is more prone to damage. The looks here are very mundane and, with the cap on, most people would not even be able to recognize what exactly this product is or does. We do wish that Codos had a few more aesthetic features but seeing how this seems to be intended for a commercial application, aesthetics were likely one of the last things on their minds. The asking price of these trimmers will put them will into the highest tier. This is simply the price one pays to enjoy the unique benefits of an electric dog nail clipper. For some, this may be too much but for others having to avoid struggling with manual clippers easily justifies the price hike. 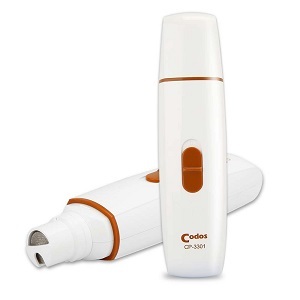 Codos dog nail clippers focus on the higher-end, electric grinder-type products. For those looking for a low-cost manual option, you will have to look elsewhere. However, for those who are willing to spend a bit more, you will enjoy a well put together clippers that are constructed of quality parts and should produce great performance for a long time. The blades that are in the scissor-style clippers and the grinding wheel that are on the grinder are both of plenty high quality. The blade is made of quality material and has a nice, sharp point while the grinder has a sandpaper-like attachment that can handle most nails and is easily replaced when necessary. The one major issue is with this scissors and their overall shape. Unfortunately, they are designed in a way that can make the prone to crushing your dog’s nail before cutting it. This can make for a very painful experience for your beloved pet and completely negates any benefit of having a sharp, high-quality blade. The blade issue mentioned above isn’t the only concern. There have also been several complaints about the handle being difficult to properly hold. While this is mostly an issue with the scissor-type clippers, a similar material is also on the grinder so we wouldn’t be surprised if some people struggle with them as well. There is a spring installed between the handles to take off some of the load, however. Outside of the questionable grips, the build quality and materials used are perfectly acceptable. The hardware used to hold the products together seem to be well made and should hold up to typical wear and tear. This is particularly true given the very attractive price point. The electric motor in the grinder is very efficient and does its job without producing a lot of noise and heat which is also indicative of a longer life expectancy. The appearance of these products does stand out some when compared to the competition. They come in a black and yellow color scheme and gives off a feel of toughness. The grips on the handle, while not particularly great, do look very rugged at first glance. The grinder has some much-needed curves that many other similar products on the market don’t have it helps it to pass the visual test a little easier. The asking price for Conair dog nail clippers is plenty affordable. In fact, they are among some of the cheapest options on the market. Obviously, the grinder is significantly more expensive than the manual cutters but compared to other grinders for sale it is very competitive. Conair dog nail clippers are made of quality materials and come in at a great price point but there are some glaring issues present, particularly in their scissors. The high risk of potentially crushing your dog’s nails or slipping from grip are huge red flags and could be a recipe for a painful experience to your dog if it occurs. We are a bit more content with the grinder but encourage anybody who goes with a Conair product to use them very carefully to avoid such an incident. These products, while being on the cheap side, actually have decent quality blades. The stainless steel is of high enough quality that it should hold up for an acceptable period of time before having to be replaced. DCOU dog nail clippers also try to stand out with their uniquely shaped handles, particularly in their “professional” nail clippers. They advertise this handle is being better-designed for hands and allows for a better grip and more natural cutting motion which adds to performance. In the process of making these unique handle types, it also resulted in the handles being a bit longer as well which we always like to see. We actually really like the cutting motion that the specialized handle brings to the table and find that these are very simple to use. The grips are also quite nice and help to ensure having a good grip and control. Combine that with a sharp blade and you have a product that just about anybody can pick up and work with. Unfortunately, the budget-priced aspect of these products really stands out here. Simply put, they are notorious for falling apart in very short notice. Specifically, the handles, while having good grips, are rather flimsy and can easily crack and break. Before they break they can also warp which affects how well they cut. You can quickly tell that they are flimsy when you pick them up as they are very lightweight. If only they would spend a bit more to make them more durable then we would be really impressed. DCOU has the traditional symmetrical handles but for those who go with their specialized handles, you will instantly tell that they stand out from the competition in their shape. In regards to handles, they come in both straight and serrated edges and there are a few different color choices to pick from including pink/black and red/black. They still look somewhat cheap due to their small and flimsy nature but by no means are the worse out there. These units fell well unit the budget category and should be within everybody’s budget. There are plenty of budget-priced nail clippers on the market and it may be hard to choose but compared to the rest these stand out primarily in their unique shape and decent performance. DCOU dog nail clippers put a small (and much needed) twist on the low-end dog nail clipper market. By introducing some rather unique handle designs they can stand out from a lot of their competition. Performance is above average but there are some rather glaring quality control issues that may impact the overall life of these. Being very budget-minded, you won’t get to enjoy the high-quality stainless steel blades that some of the more pricier brands have. While the blades do appear to be steel, it doesn’t have the level of quality and toughness that we like to see. It also means that they will wear out sooner than you may like. The handle length is about average so you might find yourself having to push down harder than you would like to cut through a nail as the blade dulls some. These clippers are very lightweight so they are very easy to hold up. We do wish the handles were a bit longer to assist with grip, however, as the grip that is present doesn’t do a great job, particularly when it is wet. There is an impact spring but it is a little on the flimsy side so your hand may get a bit tired if you are having to clip a lot of nails. We do like the inclusion of the nail file as it means one less thing you have to worry about. Similar to nearly every cheap imported clipper, there will be some quality shortcuts that are present. This is most noticeable in the rather weak handles, lackluster metal blade quality, and flimsy spring. All of this equates to a shorter life expectancy but for the price, we really can’t be too picky about that. 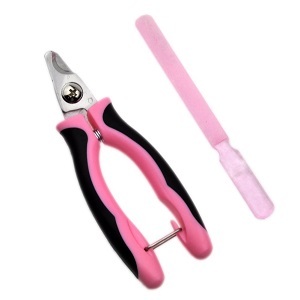 The design approach that makes Dele dog nail clippers stick out is with their bright pink and black color scheme. While we can appreciate trying to do something different, we do feel that this polarizes their target audience some as we feel most guys probably don’t want a pink set of dog nail clippers. 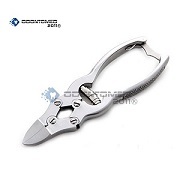 Beyond that, there is a standard design and shape that we have come to expect for scissor-style dog nail clippers. As expected, the asking price for these in one of its biggest selling points. They are extremely affordable but this comes with some sacrifices in regards to quality and performance. Dele dog nail clippers add another competitor to the congested budget-tier dog grooming market with their manual scissor-style clippers. The performance and durability are lacking but they do stand out with their unique color scheme. Unless you are on a super tight budget or absolutely love the color pink, we recommend shopping around for something a little higher quality. 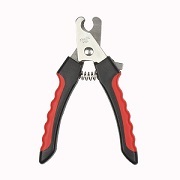 It is somewhat difficult to capture the specific trimming performance of Ecloud Shop’s dog nail clippers as there are simply so many but essentially they attempt to find a low-cost equivalent of all of the popular styles. This ends up reducing the performance some as cost considerations trump outright performance. You won’t find as high of quality of blades and grind wheels used in their products so the trimming performance does suffer some. The combination of lightweight materials and implementing the “best” features from all of the popular designs means that these clippers are very simple to use and just about anybody can use them. The only hurdle is that since the materials used are a bit lackluster, over time these clippers become progressively more challenging to use because you have to deal with dull blades and warped handles. Also, the springs that are installed for the scissor-type handles are rather weak and won’t do a good job of keeping your hands and wrists from the strain in the long term. 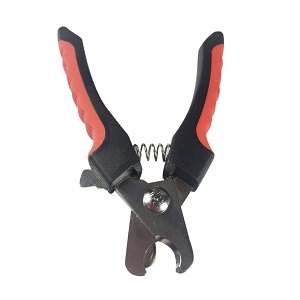 As alluded to, you will have to deal with some quality shortcuts since Ecloud Shop’s apparent strategy is to offer up a wide array of dog nail clippers at an affordable cost and taking advantage of all of the popular features and designs but without a ton of consideration on long-lasting potential. Common issues include handles giving out and the blades dulling to the point that they need to be replaced. One of our favorite aspects of Ecloud Shop’s nail clipper selection is in their huge range of color patterns. You can choose between red, orange, pink, blue and more. In addition, they even have patterned designs which are a true rarity in the dog nail clipper world. You can also choose from all of your favorite handle designs in varying grip patterns. 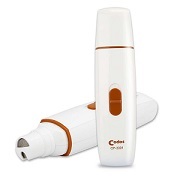 All of Ecloud Shop’s clippers are very affordable and should fall within anybody’s budget. In fact, their grinders are among some of the most affordable around. Of course, you need to go in understanding that these are budget items and will have some eccentricities. Ecloud Shop dog nail clippers offer up a diverse array of products that touch just about every popular style and form of clipper you can think of. They have scissor-style, guillotine-style, and even grinders all for very reasonable prices. In addition, they have a huge selection of color choices to meet everybody’s needs. But this great price does mean that there are some shortcuts in quality and you need to go in understanding that the performance and longevity of these aren’t nearly as impressive as other, more expensive brands. The blades used are of acceptable quality stainless steel that can handle plenty of wear and tear. The handles are also of suitable length for most and come in some really unique shapes that allow for better grip and control. Our one major gripe? The blades on their dog nail clippers don’t come from the package being very sharp. So, despite being nice quality material, you end up having to deal with dull blades no differently than other brands. If you are able to sharpen the blade yourself to a better point then it alleviates this problem. These units are very simple to use and come with safety bars and comfortable and grippy rubber grips to minimize the chance of slipping over overcutting while using. As mentioned above, we also like the shapes of the handles and feel that they make the operation more comfortable. One thing that is missing that we typically like to see is having an impact spring in between the handles to reduce hand fatigue while using. We don’t really understand why Four Paws decided against having this. The components used on these products are of very high quality and no shortcuts can be found in manufacturing or assembly. They actually feel bigger and heavier in your hand which gives off an immediate feel of toughness and durability. Four Paws has gone with a pretty safe in not a bit mundane color look on their clippers. All of the examples come in some combination of red and/or black. The one saving grace is the unique handle shapes that make them stand out from the huge number of competitors in the market who only go with the same U-shape. These clippers are a bit more expensive than many other examples. That being said, they are of higher quality and the components will last a longer period of time. You can also feel this when you hold them but when looking from afar you made immediately ask you why they can sometimes twice as much as another pair that looks similar. Four paws dog nail clippers really impressed us with the quality construction and materials that they used. We also appreciate trying to differentiate from other brands with interesting handles that we feel do make using them much easier. Our major gripes are with the lack of having a sharp blade out of the package and not including an impact spring. But for someone who can sharpen the blade themselves and don’t suffer from hand fatigue easily then these are a perfectly acceptable choice. The blades used are very high quality and the stainless steel that they are made of appears to have been heat-treated properly. The blades come nice and sharp and are shaped in a way to minimize the change of overcutting or crushing nails. The handle is very straight but long enough for most people to be able to grip and squeeze properly. Most of the typical features we like to see are here. It comes with an impact spring that is strong enough to help reduce hand strain during extended use. There is also an unlock protection and safety stop which makes it more user-friendly for you and your dog. The handles use nice, sticky rubber to make gripping a breeze. It even comes with a hidden nail file for touching up the edges after trimming. The only thing missing that we would like to have seen is some serrated or grooved rubber handles for even higher levels of grip. Even though Gonicc apparently outsources many, if not all of their products, they did a good job of doing so here. Many of the tell-tale signs of being a cheap Chinese or Indian ripoff are not present and all of the components that comprise it are of acceptable quality and workmanship. The blade should last for quite a while before becoming dull and the handles are thick and strong enough to avoid major warping or cracking. This is a very boring and rather played look that you have seen countless times if you shop around for dog nail clippers for very long. It comes in a standard red and black color scheme and has the straight handles that we are used to seeing. 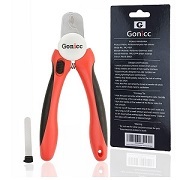 Really, the only way to easily identify this as being a Gonicc nail clipper is the fact that Gonicc’s emblem is stamped right below the blade. These definitely aren’t the cheapest trimmers on the market but should still be easily within most people’s budgets. We actually don’t see generic companies pricing their products in the same range as white labels very often but for the quality, you get here it is justifiable. Gonicc dog nail clippers are very sparse in the selection, revolving about their single scissor-style. However, they have it figured out as the performance, build quality, and ease of use are all excellent. Yes, the styling could use a minor overhaul but it is easily overlooked. While you may have to be a couple of extra bucks for these it is worth it for the quality that you are getting. The stainless steel and blade thickness is quite underwhelming and you may notice that the blade dulls much sooner than you would like. 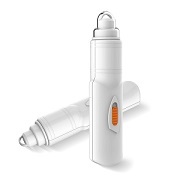 In addition, the handle is a bit on the small side which adds to the difficulty and operating this dog nail trimmer. And since there is only the one type and size you are sort of stuck with it. The grips, while made of some sort of rubber compound, are not great and still cause slipping. As mentioned above, the handles are also on the small side so someone with bigger hands may struggle to get a comfortable grip. Really the only positive is the lightweight qualities so you don’t have to worry about having to hold a heavy object. We also are glad that GVESS included an impact spring but it is a bit on the flimsy side. There are several notable quality issues with this product. We have already discussed the rather weak blade that loses its edge and makes it difficult to properly cut. In addition, there are reports that the locking pin falls off after a short period of time and also issues with the handle warping after a relatively short period of time. This is a very standard look that has been copied by many other brands. Your color selection is limited to black/red and the design of the clippers are the standard symmetrical plastic and rubber shaft with scissor-style blades. Prices for this product are very reasonable and should be within everybody’s financial reach. However, you can definitely tell that some shortcuts were made in order to have this competitive price point. We actually wouldn’t mind spending a bit more for a higher-quality end result. GVESS dog nail trimmers try to make something that is serviceable for your dog while being low-cost. They definitely got the second part down but there are simply too many issues with performance and durability to get excited about this one. Add on the fact that they only appear to offer one type of dog nail clipper and it shows us that perhaps they didn’t do enough research into what is actually required to make a good pair of dog nail clippers. Since IHP has so many options to choose from it is difficult to focus in on a specific product. Rather, we are giving you the “big picture”. Overall it is apparent that IHP is trying to find a product for everybody’s needs by simply offering everything. Unfortunately, it appears that by doing so they have spread themselves out a bit too thin and many of their products simply don’t perform all that way. This is particularly noticeable in the low-quality blades that are used in their scissor-style trimmers and the motor on the grinders is a bit on the weak side. There are some really refreshing handle layouts that IHP dog clippers have which we think definitely bump it up a notch from an ergonomic standpoint. While often made of rather cheap materials, the result is a very lightweight product. The grips, while nothing amazing, do a good enough job for most people. We have seen some obvious quality control shortcuts. Surprisingly, this is mostly in their grinder dog nail clippers as they have had some issues with the motor going out much too soon. Also, the sandpaper attachments used have a tendency to unfurl and fall apart after a short period of time. The ironic part is that the grinders are actually more affordable than many of their manual-style nail clippers which might explain why most of the quality issues revolve around them. We do appreciate the huge array of products to choose from. They come in all sorts of shapes, sizes, and color so you should not only find something that works for your performance needs but also from an aesthetic standpoint. Our only gripe is that some of the products look “cheap” but for the sheer number of refreshing colors to choose from we can overlook that to an extent. The asking prices on these units are actually somewhat confusing. The grinders they offer are extremely well-priced and actually more affordable than many of the manual dog nail clippers on the market. However, many of their manual clippers (which traditionally are more affordable) actually cost MORE than their grinders! We aren’t sure the reasoning behind this but will leave it at this: if you are shopping specifically for electric grinders you are going to be really impressed with the prices and if you are after a manual scissor-style or guillotine-style pair of clippers you are going to be very underwhelmed. IHP dog nail clippers have a very interesting approach that has some major positives and some major negatives. There are some glaring performance issues as well as some doubts about the durability. However, you get to choose from a giant selection of products that come in many colors. Also, they offer some of the most affordable grinders we have ever seen but many of their manual products are priced way too high. Depending on specifically what you are looking for will determine how good (or bad) a buy is here. You should be impressed with the caliber of trimming performance that JW Pet dog nail clippers possess. The material they use is quality steel and it has no problems handling even thick dog nails. The interesting part is that, at first inspection, the blades don’t really “look” that sharp. But thanks to an optimized design and nice leverage from the handles, the blades are able to do their job without much concern about crushing your dog’s nails or requiring a ton of applying pressure. Just make sure you get the properly sized nail clippers for the size of your dog (small, medium, large, etc.). We find that these clippers are incredibly simple to use. There are plenty of features installed that play a part in this. These include their non-slip grip clipper that allows for a great grip even in moist environments. They also have a cutting guard in place that helps to stop you from accidentally cutting your dog’s nails too short. We also really appreciate how JW Pet has made various sizes of nail clippers depending on the size of your dog instead of trying to do a “one size fits all” approach like many of their competitors. Build quality is on point with most of their clippers. Simply holding a pair, you can tell that there were more thought and attention that went into design, manufacturing, and assembly. The handles feel sturdy and can easily handle what you can throw at them without concern of warping or cracking. Even in their smaller sizes that have different-sized handles, they are plenty tough for most people’s needs. All of JW pet’s dog nail clippers come in a silver/black/yellow color scheme and have JW Pet’s emblem adorned somewhere on the handle or blade. We appreciate the subtle visual features that they have added to stand out from the crowd. Things such as adding bumps on the handles are small changes but we appreciate them and feel that that do make the clippers “pop” a bit more. These are by no means that most affordable clippers you can find but the prices are more than justifiable and typically fall in the mid-price range. While we suspect that most people won’t throw too big of a fit over a couple of dollars, for those who are hesitant rest assured you are getting a higher-caliber product than many of the more affordable options out there. JW Pet dog nail clippers really do an impressive job on all fronts. Their performance is excellent, the build quality pays close attention to details, and their looks are refreshing enough to stick out. There are also plenty of choices depending on what size of dog you have or if you prefer a scissor-style or guillotine-style pair of clippers. Prices are a bit higher than some but for what you get it is more than fair. The blades used here aren’t of the great quality and don’t really come very sharp to begin with. This not only can make it more difficult to get a clean and straight cut but it also increases the chance of accidentally crushing your dog’s nails. We do like the extra long handles that Kamoltech dog nail clippers have, however. This gives some extra leverage and allows for more powerful passes each time they are used. While we do enjoy the long handles (mentioned above) the major gripe with them is that they are wrapped in a rather slick plastic/rubber concoction that can be rather difficult to hold and handle. We also wish there were some handle shapes that are more specialized such as we have seen in other brands. Finally, only one of the products has a significantly beefed up impact spring so if you plan on using these a lot you might find your hand or wrist becoming a bit weary from the constant impacts. Build quality is about what we have expected from many of the imported dog nail clipper models. The metal is a bit on the cheap side and the handles could make do with some stronger materials but they should manage for an acceptable period of time before things start to fall apart. While the shape of the trimmers is rather mundane, at least they come in multiple color options. Of course, Kamoltech has the ever present red and black look but on top of that, you can choose pink and sky blue options as well. We like that they have expanded their color palette some. One thing that really baffles us is why these are so much more expensive than many other similar pairs of dog nail clippers on the market. These fall well into the mid to even premium price range and unfortunately the quality and performance you get just don’t match that. Kamoltech dog nail clippers have a standard design approach and try to stick out some by having extra long handles and a few other color patterns (which we like and appreciate). Performance and durability aren’t bad, but this asking price is simply too high for what you are getting. 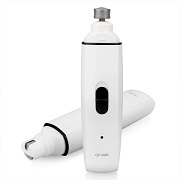 For those willing to spend this higher asking price for a pair of clippers, you can find something better with even some of the electric grinder-style models being within financial reach. Despite the very similar design that these units have, the blades are actually solid and made of quality steel that comes with a great, sharp edge and stays sharp for quite a while. As an added benefit, the handles are plenty long and give you good leverage to produce adequate cutting force with each use. We do wish there were some other styles such as guillotine to compare to, though. 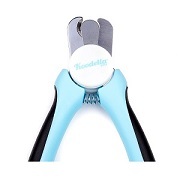 Koodella dog nail clippers are a breeze to use and come with all of the safety and convenience features we look for. 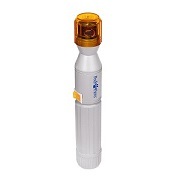 It has a quick guard that will help to prevent you from accidentally overcutting when using on your dog. In addition, the clippers come with a lock in blade feature that can safely keep the blades from being exposed when not in use. The handles, as mentioned above, and plenty long which makes gripping easy and the grip material on the handles is of high quality as well. It also has an impact spring which absorbs some of the force of consistent use, but it could be a bit larger. Overall, this pair of clippers is made of quality construction and materials and shouldn’t pose any major headaches. The are actually a bit on the light side but it doesn’t hurt them here as the handles, despite being lightweight, are resilient enough and combat the signs of warping or cracking. Really, the only thing we are underwhelmed with is the somewhat small impact spring. The appearance here is very standard and you have likely seen many other competitors with a similar design. Really, the only features that make Koodella dog nail clippers stand out from the competition are with its baby blue and black color scheme and the white portion near the clippers that displays the Koodella logo. We would appreciate some additional color options in the future. You may find that this product costs a bit more than many other clippers that we have reviewed that look nearly identical. However, we feel that the performance and build quality are bumped up a notch and somewhat justify that higher asking price. That being said, we are only talking about a few extra bucks so it shouldn’t be a bank buster for most people anyways. Koodella dog nail clippers really do everything well in their simple, straightforward approach. A combination of a great, sharp blade and large handles with nice grips means that the performance aspect should be to your liking. Also, the materials used should last for quite a while before any issues arise. Yes, there is only one product to choose from and it is a bit more pricey than some of the similar competition but we feel it is worth that extra bit of money if you have your heart set on a quality pair of manual scissor-style dog nail clippers. There are quite a few types of Master Grooming Tools dog nail clippers to look at and each has its own unique pros and cons. For the sake of simplicity, we will go over some key summaries. In general, most of their clippers do an acceptable job in performing but are not industry-leading. There are some notable shortcuts that stop these products from being home runs. For instance, the blades on the scissor-style nail clippers are a bit on the flimsy side and can break and chip much earlier than you would like. Also, the torque on the electric nail grinder is somewhat lacking which can make a job much more challenging. This might not be an issue to most people but they are worth noting. All of Master Grooming Tools’ products are very user-friendly and easy for anybody to pick up and start operating. 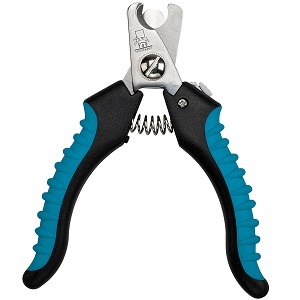 The particularly like the great, grippy handles on their parts and the large serrations on the scissor-style clippers that allow for great grip and control. The shapes of the handles are also refreshing and designed in a way that the manufacturer believes will improve performance and comfort. Other helpful features include safety guards, impact handles, and more. Build Quality is about what you would expect for products at this price range. Outside of a few notable quality escapes that are mentioned above, you should expect these dog nail clippers to last for quite a while. The materials used, while somewhat thin in some cases, is of nice quality and should handle the wear and tear one would expect them to handle. And the handles are made of nice, thick high-quality rubber that can handle most things you can throw at them. There are many different styles of clippers to choose from and, in some cases, the styling is truly unique and stands out from the very congested crowd. There are multiple color options include a deep green, light blue, pink, dark blue, and more and the initials “MGT” stamped somewhere on the unit to signify the brand. This level of color choices is one of the largest we have come across and really adds a nice selling point to this brand. The asking prices for these are a bit on the high side in some cases. Specifically, the grinders and guillotine dog nail clippers are a bit more than most other products around. We assume that this is partially due to the MGT name. Master Grooming Tools dog nail clippers offer up a nice range of products that hit all of the types and categories that we look for. The performance is acceptable in most cases outside of a couple issues to look out for and the features are diverse and plentiful. We also appreciate the refreshing styling that some of their units possess. Yes, the prices can be a bit on the high side but that are justified for the most part. The trimming ability you enjoy with Millers Forge dog nail clippers is among the best in the industry. The blades that they use a sharp and made of quality steel piece that stays sharp and can handle plenty of abuse before going dull. The handles are also optimized in shape to allow for a quick and seamless pass every time you close them which further improves the efficiency of each trim. We also like how there are different sizes for different sized dogs which show us that Millers Forge put forth the consideration that not all handles are equal and that they should be optimized for a given dog’s size. All of these units are simple and easy to use. There built-in guards in all models which help to prevent overcutting. They also come with safety locks to allow for safe storage. The handles that are used come with comfortable plastic grips that are long enough to fit comfortably for most. The handle shapes are also designed to be ergonomic and allow for the greatest performance with least amount of pressure. Most of the scissor-style models also have the impact spring that we like to see. Many of the examples come with replacement steel blades as well. You can tell that Millers Forge has put a lot of thought into choosing the materials and construction methods used on their pet grooming tools as they seem to last for many years without issues. Really the only “weak” point is that the blades may wear some over time but they include a replacement which is very helpful. The handles are strong and durable and the grips they use can handle minor scratches and abrasions without coming undone. Our one minor gripe about Millers Forge dog nail clippers is in the styling. They have very simple designs and not a lot of choices in regards to colors. Nearly all of their products come in a solid silver of silver and white color scheme. There are a few that come in orange and red but these are the minorities. That being said, it does actually give off a more “professional” look that might look better in a business setting. The trademarked Millers Forge emblem is also adorned on the side. The asking prices for these units definitely aren’t the cheapest but there are still more expensive options out there as well. Typically you can expect them to fall in the mid price range, which is an excellent deal for what you get. But for thost more concerned about saving cash, it may still a bit high. Millers Forge dog nail clippers really knock it out of the park in just about every category. The trimming performance is superb thanks to quality blades and excellent design. They are also comfortable to use and have plenty of helpful features to make them easy to use for everyone. The price, while not the cheapest, is more than reasonable for what you get. For anybody in the market for a scissor-style or guillotine-style set of manual trimmers we highly encourage checking out this brand. The trimming ability of these dog nail clippers is simply fantastic. Not only are the blades made of high-quality metal that gives you a very sharp edge, but they are also designed to produce a fast and efficient swipe with minimal effort. The quickfinder technology is also well balanced and the result is a product that allows you to trim dog nails with great precision and accuracy. In addition, the handles are of an acceptable length so as to allow for adequate leverage during use. They also have traditional nail clippers that don’t have the QuickFinder feature that isn’t bad, either. 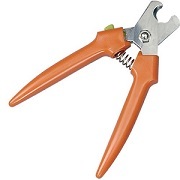 It would really be difficult to make a pair of dog nail clippers that are easier to use than these. Miracle Corp’s Quickfinder technology takes all of the guesswork out of locating the proper spot to cut a nail and makes it so that a complete novice can handle his or her dog’s nails with full confidence. You have both guillotine-style and scissor-style layouts to choose from which both have been designed to be user-friendly. The handles are easy to grip and the rubber grip material is of high enough quality to make most happy. They also have impact springs to reduce the load on your wrist while using. The materials and construction here are top-notch. The handles can sustain plenty of use before potential issues arise and the blades stay sharp for a longer period of time than most other competitors. There are electronic components on this product, however, so you will need to be more careful around water and also dropping it. That being said, the electronics seem to be rather resilient for the most part so you don’t have to worry about being overly careful during use. The design of Miracle Corp dog nail clippers is rather unique in that they are very thick and bulky. The first thing you will probably notice is how much meatier the handles are compared to the competition. This is simply the price of admission for including their unique QuickFinder technology. The actual level of attractiveness of this thick design is subjective but it definitely stands out from most other products. There are also a few different color combinations to choose from which we appreciate. Unfortunately, Miracle Corp dog nail clippers aren’t cheap. In fact, they are some of the most expensive products on the market and may very well be several factors higher in price than some of the other dog nail clippers you are looking at. But what they offer for those who are willing to pay the high price is a truly unique technology you will be hard-pressed to find anywhere else. It is very refreshing to see such a unique technology be implemented in a pair of dog nail clippers and Miracle Corp does it quite well. The performance and sheer convenience that you get from their QuickFinder technology is without comparison and the components and build quality isn’t bad either. The biggest hurdle is the high initial asking price but we feel that for those after the most simple and straightforward dog nail clipping experience as possible, it is a price worth paying. You can tell that Odontomed2011 knows what they are doing when it comes to cutting. Their blades are extremely sharp and the steel they use is of very high quality and are incredibly tough. They appear to be designed in a way to make precision cuts that don’t stray much from their intended path. 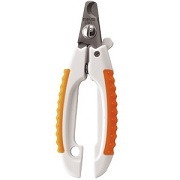 The handles are also quite long which allows for easy handling and powerful and quick snips. While the trimming aspect is easy, the rest of these dog nail clippers are rather straightforward and simple as well. You won’t find the big cushy and grippy handles or the various safety features you are used to seeing on some other products. However, the handles are designed in a way to still be comfortable to hold despite not going heavy on the grips. Thankfully, Odontomed2011 also included the impact springs that we love to see and they come in some very beefy designs that do a great job of reducing the load. Build quality is superb across all of their products and you can expect one of these examples to last for many years without issue. You may immediately notice that Odontomed2011 seems to prefer using metal over plastic and rubber for many of its components and, while this obviously costs more, it also means you have a much tougher material that can better handle conventional wear and tear as well as the elements. These are very sleek, professional trimmers that look right at home in a veterinarian setting. The high level of metal used really sets them off and makes them look a touch above a lot of the plastic competition out there. There are every some very progressive color schemes for the metal including a matte black and gold finish and even a rainbow colored stainless steel. The price range on OdonoMed2011 dog nail clippers is rather diverse and highly dependent on the type of material you decide to go with. On the lower end, they can be found in the mid-range price tier and on the higher end you will expect to pay among the highest asking prices in the industry. OdontoMed2011 is another brand that has a ton of experience in surgical-level cutting and trimming tools and applies this to their line of dog nail clippers. Overall performance is superb and the build quality matches it. There aren’t a ton of features but it really doesn’t need most of them since they are relatively easy to use. We also like the progressive look that these units have. But they certainly aren’t cheap, particularly if you decide to go with one of their more exotic color combinations. No matter which Oster dog nail clippers you go with, you should enjoy a very good performance. On their manual cutters, the blades are of plenty high quality and machined to a nice, sharp point. The handles are designed to be efficient at performing the cutting motion. In their electric grinders, you will enjoy powerful motors (particularly in their corded professional model) that produce plenty of torque and is delivered to the sandpaper grinder attachment with minimal vibration. Oster understands that many people that use their nail clippers do so in a professional setting so they have made sure to include all of the necessary features and modifications in order to make them quick and easy to use. Things such as adjustable safety guards, ergonomic handle designs, safety locks, and comfy handles are the norm in their products. They also offer up multiple speed variations in their electric grinders to make them more suitable for multiple applications. They also advertise that their grinders are extremely quiet which makes them easier to use around animals that may be finicky to loud, foreign noises. The overall build quality is top-notch and any of these Oster dog nail clippers should last for several years. The manual clippers implement oversized, robust hardware and the springs are of an adequate size so as to not be easily bent or warped. The material used is quality and not shortcuts were taken in the assembly or heat treat of it. The grinders, while a bit more fragile, have robust motors that are capable of many hours of operation before giving out. While looks aren’t overly important to a lot of people when it comes to nail trimmers, we are somewhat underwhelmed with what Oster has brought to the table. Again, for a professional setting, going with a more subdued color and design might be preferable since you aren’t there to make a fashion statement. But we do wish there were a few more choices in regards color and handle selection. Oster dog nail trimmers definitely aren’t the most affordable on the market, but you still shouldn’t have to deal with much sticker shock on their manual examples. Their electric grinders, as expected, are significantly more expensive (particularly their professional model) but the quality you get to enjoy makes the pill easier to swallow. Oster dog nail clippers really excel in just about every category. There is enough of a variety of choices and types to meet most people’s needs. The performance is fantastic and can easily handle the most demanding applications while still being user-friendly. The looks are subjective but this is only a minor concern. The prices aren’t the lowest but they are more than reasonable for the great product you get to enjoy. Unfortunately, we are really disappointed with the trimming performance of the Pedi Paws electric nail grinder. The motor that is used is simply too weak and it tends to bind up and stop when applied to anything that even has a little bit of friction. Plus, the grinder attachments used are not overly sharp and don’t fit the head of the grinder very well. You may find yourself really struggling to grind down your dog’s nails, particularly if he is a larger dog. The product is lightweight which is nice considering that many electric grinders can be a bit on the large and heavy side. However, this is likely attributed to having too small of a motor which significantly impacts performance as mentioned above. It seems that Pedi Paws was trying to create a product that was very gentle on your dog’s nails and slowly and safely ground them down. While we can appreciate this approach, the result here is a product that requires a ton of effort to make work properly. There are some notable fitting issues with the various components of this nail grinder. The grinder head is notorious for not properly fitting on the shaft, Plus, the base, while lightweight, is rather thin and flimsy. The motor is on the cheap side as well and not only does it not produce a lot of power but it doesn’t have quite the production life as a lot of more expensive motors that are used in other grinders on the market. Compared to its competition, this is actually a pretty attractive grinder and rather progressive in its styling. It comes in a silver frame with orange and blue accents and it really stands out. Plus, there are some serrations in the base that make it resemble some futuristic lightsabre-like weapon from science fiction! 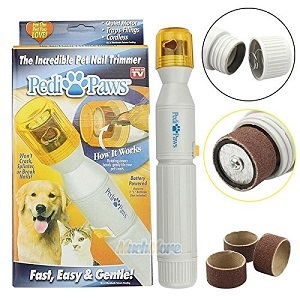 The biggest selling point of the Pedi Paws nail grinder is its great asking price. It is among the most affordable electric grinders on the market and actually competes with some of the premium manual dog nail clippers in asking price. However, as you have seen above, this comes with some sacrifices in performance and build quality. We really like the idea of having a more budget-conscious electric dog nail grinder on the market since many are quite expensive but Pedi Paws simply takes too many shortcuts to make this a strong recommendation. Limited performance, difficult user experience, and fitting issues really stand out here and make the great asking price look less attractive. The trimming ability here is somewhat lacking. Specifically, the motor is a bit on the small and weak side. We understand that this is the tradeoff one makes to have a product that is extra quiet but we feel that maybe PepPet went a bit too far to that extreme. The fact that it also doubles as a hair trimmer might also play a bit in the decision to go with a lower RPM and less powerful motor. The grinding attachment that is supplied is relatively high quality, however, and the abrasions on the surface have enough friction to grind down some despite the weak motor. We love the ability to swap between a grinder and a hair trimmer here which, in theory, would reduce the number of dog care products you need to buy. Unfortunately, the PepPet nail grinder doesn’t do either particularly well and you may find yourself struggling a bit more to get the job done than compared to having two separate products that have one task. Many of the features that are traditionally on an electric grinder are missing so you may struggle not only with properly controlling the unit but also in how long it takes to finish a task. Build quality is about average here. The pieces fit together relatively well and there aren’t too many vibration issues due to misalignments (the weak motor may play a part in this). However, the plastic is a bit on the thin side and you will immediately notice that this product doesn’t feel quite as “sturdy” as others. Also, the motor is not only weak but also somewhat low quality and won’t have the life expectancy that some would prefer to see. The looks here are very straightforward but PepPet does a good job of incorporating the modular head into the unit without making it look forced. In fact, if you showed someone this product with the grinder attachment or hair trimmer attachment on it, they would probably suspect that that is its only purpose. Sorely missing are serrated grips or any sort of colorful features and aesthetic additions. The asking price of this nail grinder is actually very reasonable and cheaper than most other nail grinders on the market. The fact that it doubles as a hair trimmer makes it very tempting for someone looking to purchase both products but is one a very tight pet budget. Just go in understanding that you will make some sacrifices in order to enjoy the money savings. The PepPet electric nail grinder is a unique approach in that it doubles as a nail grinder as well as hair trimmer. The selling point here is that they try to advertise that the product is very quiet and gentle on your dog’s nails and hair but in all actuality, we find it a bit on the weak side which may add quite a bit of time to your dog grooming task. For those on an extremely low pet budget you might be able to make do with this but for everyone else, we recommend saving up a bit extra and buying two separate products that do their respected tasks better. The blade material is of acceptable quality and the edge comes plenty sharp for most people’s needs. The major issue we have is that the blade and handles are a bit on the small side so for large breed dogs or dogs that have particularly thick nails you may struggle some to cut them in one pass. We do like that Pro Pet Works also includes a nail file built into the handle for smoothing down the edges. This product opens and closes with ease and doesn’t take a lot of effort to elicit cuts which are good for those with weak or sensitive wrists. The handles have a nice non-slip grip that helps to maintain good control. As mentioned above, we wish that the handles were a bit larger, however. It also includes a safety stop guard which minimizes the change for overcutting and makes this pair of nail clippers much easier to pick up and learn quickly. There is also an impact spring of about average size that helps some in relieving muscle strain from slamming the blades open and closed. Build quality is about average and very similar to the other brands that utilize this similar design. We suspect that some of these brands might import their clippers from the same manufacturer which explains why they look and perform so similarly. The metal on the blade edges stays sharp for an acceptable period of time before you have to worry about resharpening them. This design isn’t ugly but is very generic and essentially identical to dozens of other brands on the market. The Pro Pet Works dog nail clippers come in a black and baby blue color scheme with the Pro Pet Works logo adorned on the face of the blade. We wish that there were some extra color schemes to choose from and perhaps some other designs to help bring more variety to the table. 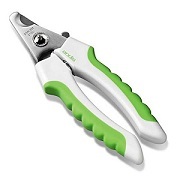 The asking price for these is actually a bit higher than many other manual scissor-style dog nail clippers on the market. They perform fine and the quality is acceptable but we question why they are a few dollars more than other brands that are selling essentially the same thing? Pro Pet Work Dog Nail Clippers do an acceptable job of giving us a quality pair of manual-style nail clippers that should last a while. There is a limitation on the selection of product types and colors but for those who know you specifically want manual scissor blades then these will do. We do wonder why they cost more than other similar designs but assume that the strong reputation that these have in the online community might play a part in the slight premium charge. Since there are so many models to choose from, it is difficult to give an overall summary of trimming performance. We will say that QINF has outsourced the same products as many other brands that have very high ratings on Amazon and other sites so you can rest assured knowing that you are getting a product that has proven results. On average, the blades that they use are of acceptable quality and the handles are about average length. All of the features we typically look for in dog nail clippers are present in the variety of models that QINF sells. Things such as safety locks, overcut protection, and padded/serrated grips are the norm. Because of this, all of the products discussed have relatively low learning curves and anybody should be able to pick them up and handle them with a little practice. These units won’t be the longest-lasting on the market but, for the most part, their build quality is acceptable. You will find hard plastic in the place of metal in many areas and the blades, while sharp, won’t last quite as long as some of the premium lines, but they do a good job of finding a happy medium in most quality aspects. Since there are so many products to choose from, there are quite a few different looks you can decide on. This not only varies in regards to color schemes but also handles shapes and even whether or not you want wavy serrations on your handles. However, you won’t get the high-quality vibe that other brands emboss with QINF. In other words, you will know that you are looking at a product that has likely been imported from a mass production manufacturer. This isn’t necessarily a bad thing but it is worth mentioning. One thing that really stands out to us is why QINF dog nail clippers are so much more expensive than many other brands on the market that sell essentially the same products. QINF doesn’t have the esteemed reputation in the dog world as some of the other brands so this premium charge that they have is a bit of a mystery to us. QINF has decided to go the proven route of having a wide variety of popular, manual guillotine and scissor type dog nail clippers. Most of their products are about average in regards to trimming performance and durability. What baffles us is why they are so expensive compared to very similar products on the market. In the very congested dog nail clippers market it is important to do something that makes you stand out and apart from their huge product range, QINF seems to be lacking that. The blade material on both the Resco guillotine style and Resco scissor style dog nail clippers are fantastic and among some of the best in the industry. The edges are actually hand sharpened and micro-honed to guarantee a super sharp finish. The handles on both products are adequately long and provide plenty of power for even the largest dog nails. All of Resco’s products are super easy to use. The handles are designed to be very ergonomic and both come with thick, beefy impact springs that help to reduce to strain on your wrists. The handles are also powder coated on many examples which guarantee a smooth finish and no rough edges. In addition, the guillotine-style clippers have a patented blade replacement technology that makes swapping out the old blade for a new one much easier and more affordable. There are no shortcuts anywhere to be seen in the manufacture of these dog nail clippers. Only top quality materials are used and extra effort is put into them to ensure that they last a long time. A huge double lock pivot screw is used to hold the handles together and allow for a tight and smooth operation. While many other brands will use mostly plastic, you will find that Resco utilizes a lot more metal in their handles which we definitely prefer. As a bit of added protection, the exposed metal is also chrome plated. These are very industrial-looking but we actually love it. The exposed metal with the chrome finish gives off a look of professionalism and quality. And for those who would prefer a more colorful solution, they also offer a wide range of colors including yellow, red, blue, purple, and more. Resco dog nail clippers definitely aren’t the most affordable on the market and you may find that they oftentimes approach the most expensive price tier in the industry. However, you are getting a quality product that will easily pay for itself in the long run. Resco really has nailed it out of the park with their lineup of guillotine-style and scissor-style nail clippers. The performance is superb thanks to the razor sharp edges and optimized handle shape and the build quality matches by utilizing quality metal components and not skimping on the assembly process. They are also easy to use and should minimize how much strain goes into your wrists and hands. Finally, there are loads of colors to choose from. They are rather expensive but it is a price we feel is easily worth it as you will have a quality pair of nail clippers that will serve you for years to come. These are budget items and you can really tell when looking at trimming performance. They blades are made of a lower quality metal and are not overly sharp. Because of this, you may struggle to properly cut dog nails and it will only get worse as the blade quickly wears down. Also, the handles are typically on the small side which minimizes the amount of leverage you can put forth. While these units have some of the features we like to see including impact springs, safety latches, etc., they are done in a very low-quality way and this really impacts how effective they are. The handles on most don’t have proper grips and that, coupled with them being rather small, means that you may struggle more than you like to properly control them. Similar to many of the budget examples we have looked at, there are some major build quality concerns with these. As mentioned above, the blades are weak and notorious for wearing down and cracking after a short period of time. On top of that, the handles are a weak plastic and have been reported to crack and warp after some use. In addition, the hardware used to hold the handles together and also to fasten the blade to the rest of the clipper are very weak and can easily break. Due to the large, diverse range of products that Toogoo(R) offers, you will see quite a variety of colors, sizes, and shapes to choose from. However, all give off the vibe of being extremely low quality and will typically utilize cheap plastic in the place of more attractive metal. Easily the strongest selling point with these is in their great asking price. They are among the, if not the, most affordable dog nail clippers we have come across. But in order to achieve this incredible price point, huge sacrifices in performance and quality had to be made. Toogoo(R) dog nail clippers have plenty of products to choose from and the asking prices are extremely competitive, but that is really where the positives end. The performance is lackluster at best and the expected life of these units means that you will have to replace them after a short period of time. Not only that, but they are rather difficult to use and handle even when they do work. We encourage you to spend a bit extra and get a much better product. Similar to nearly every other pair of super budget clippers that are imported, you really get a mixed bag here that fluctuates towards the bottom of the performance tier. This is because of less than amazing steel that is used in the blade as well as somewhat inconsistent machining and fit. The handles themselves are long enough in most of their products but due to the lower levels of material and quality control in the cutting elements, you may have to deal with somewhat dull blades that don’t last for a long period of time. One thing about Uxcell dog nail clippers is that they are very lightweight. However, this comes at the cost of somewhat thin handles that don’t have the beefy and comfy grips we like to see. Also, not all of their products come with a form of impact resistance such as springs and those that do have them have resorted to a rather small and flimsy spring. Not all of their products come with overcut protection or safety fasteners, either. Build quality is lackluster at best, and you will likely have to deal with things going awry much sooner than you would like. We have already mentioned the blade issue above but beyond that, the handles are rather flimsy and prone to cracking. Furthermore, the hardware that holds the handles together and small and weak and has been known to break or fall off after some use. 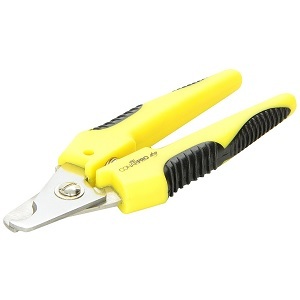 There is a huge range of colors, shapes, and sizes to choose from since Uxcell imports all sorts of dog nail clippers. One common theme among all of them, however, is their flimsy appearance. They lack thick and attractive metal parts really shows here and most people that see a pair of Uxcell dog nail clippers will instantly think that they are on the lower end. The biggest pro here is definitely the price. No matter what type of product you go with, it will likely be among the most affordable on the market. However, as we have already discussed, this comes at the cost of some major quality and performance shortcuts. Uxcell dog nail clippers offer up a huge range of products and all of them are very attractively priced. However, there are simply too many issues with performance aspects lacking or clippers falling apart. Time and time again we see this being the theme with the ultra low-end nail clippers and it is evident yet again here. Compared to other similar priced products on the market, Wahl dog nail clippers tend to be about average, without bright spots and areas of concern on both extremes. Specifically, their blades are made of nice, quality steel that is properly heat treated. However, there have been many reports of the blades not being very sharp upon arrival which means that you are forced to sharpen them yourself. Also, the nail guard that is intended to limit the amount of nail you can put inside is lackluster on several of the products (with the Wahl EZ-Nail Clipper being an exception). Also, the electric grinder’s motor is a bit on the weak side so it may struggle with larger nails despite the grinder bit being perfectly acceptable from a performance standpoint. All of the features we look for are present across most of Wahl’s products. This includes the soft touch grip which, in this case, is very large and comfy to the touch. They also have impact springs and safety latches. The nail guard is also present on many of the products but, as mentioned above, they could have done a better job of designing it. In regards to the handle length, most people except for those with the largest of hands should be able to grip the handle comfortably. They also have some really cool features not seen in many other products such as a motorized rotary grinder present in their EZ-Nail model. One area that Wahl really shines at is their build quality. All of the components are of great quality and there aren’t any major shortcuts in construction. The only area that this isn’t the case is in the blades not being overly sharp from the manufacturer but that is less of a quality issue and more of a vital manufacturing step being left out. 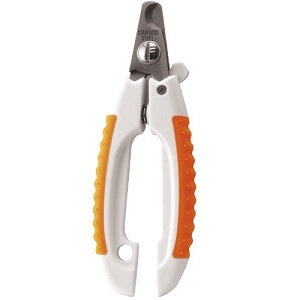 Most of Wahl’s dog nail clippers come in their standard bright orange and white color layout. Exceptions to this include the EZ-Nail which is available in blue/black and their electric grinder which comes in a black color. The designs are nothing groundbreaking but they do appear to be high quality thanks to the large handles and grips. Wahl dog nail clippers certainly aren’t the cheapest on the market and, in some cases, flirt with the premium price tier. However, they are still within a price range that most people can afford and you definitely get quality parts if you go with them. Wahl brings to the table a small but diverse range of dog trimmers including manual and electric and in three most popular types. The build quality and components are of great quality and there are some really helpful and refreshing features installed on many of their products. However, there are some performance issues that need to be addressed for these to be a home run recommendation from us. They are also a bit pricey but still within reason. What are the Different Types of Dog Nail Clippers? As you can probably tell by now, there is a huge range of dog nail clippers to choose from. While all of these products have effectively the same end goal of taking care of your dog’s nail needs, they approach this challenge in very unique and specific ways. And, depending on the specific needs of you and your dog, one type might be better than another. 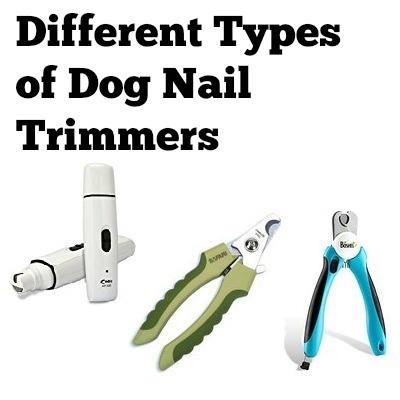 There are basically three primary types of dog nail clippers to choose from: Scissor style nail clippers, guillotine style nail clippers, and electric nail grinders. 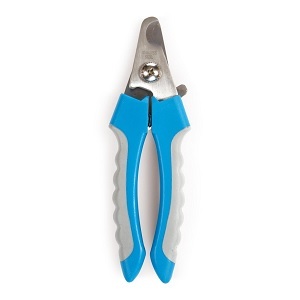 Scissor-style nail clippers are the most popular type, with a vast majority of the dog nail products on the market falling under this type. 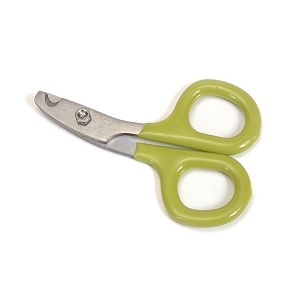 As the name suggests, this type of clippers resembles a pair of scissors in both appearances as well as operation. Basically, you will have two separate handles with blades on top that are attached by a rotating element somewhere in the middle. Cutting dog nails are done in a way similar to how you would cut some paper or hair. The main benefits of these products are in their low cost and simplicity. They also are more versatile then guillotine style nail clippers in regards to accommodating a larger range of dog nail sizes. The primary concerns come with running the risk of overcutting or crushing your dog’s nail which is not only painful but can lead to open wounds and scars. 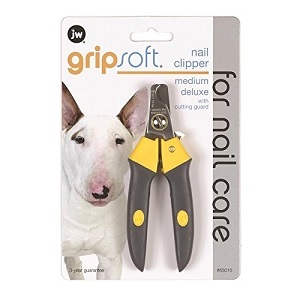 Guillotine style nail clippers are less popular but still have a notable presence in the dog nail market. Unlike scissor style nail clippers, guillotine style nail clippers don’t always come in a traditional scissor shape and can come in a range of shapes and sizes. Specifically, a popular layout actually more resembles a traditional manual stapler than a pair of nail trimmers. A good example of this is the Miracle Corp pair we talk about above and many of you might find similarity with these and the style of nail clippers most humans use on their own nails. Guillotine nail clippers can add an extra level of control and precision as you are forced to “center” up your dog’s nail inside the cutting area for them to properly work. This typically helps to ensure a cleaner and straighter cut. However, you can still run the risk of overcutting if you aren’t careful. Also, guillotine style nail clippers are more limited in the range of dog nail sizes a particular product can handle. Because of this you will more often see “small”, “medium”, and “large” sized clippers that come with different sizes of cutting areas. An electric nail grinder approaches dog nails by grinding them down rather than cutting or trimming them. This is thanks to the use of a small electric motor that is either battery-powered or powered by an outlet. The main benefit of using these is having higher levels of control over removing nail material as you can vary both application pressure as well as the grinding angle. This makes electric nail grinders great for rounding edging to make them less sharp. A popular 1-2 attack is to actually do the primary cutting with a scissor or guillotine style pair of nail clippers and then finish off and round the corners using an electric nail grinder. The biggest cons of nail grinders are that they are often loud and obviously have moving parts. This has a greater chance of spooking your dog which can make the whole process much more challenging. They also are typically more expensive and by having moving and electric parts so they are more fragile and have to be kept away from water more diligently than non-electric examples. 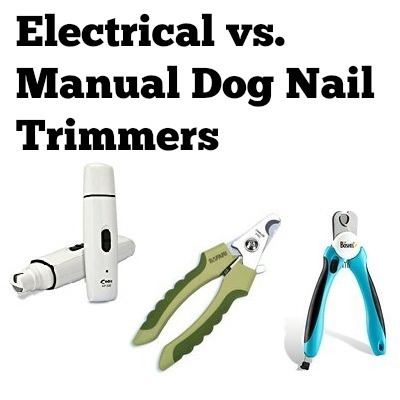 Another way to break down the different types of dog nail trimmers is their power source. These fall under either manual power (or “human powered) and electric powered. 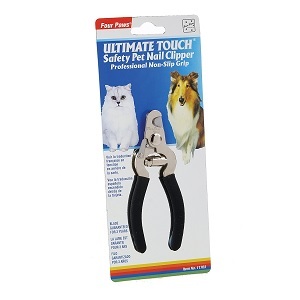 Manual power dog nail trimmers are by far the most popular type. Both the scissor-style and guillotine-style discussed above fall under manual power as they require the use of force from a human hand and wrist to operate. That being said, not all manual power clippers are the same and there can be a rather large range in how much force and effort is required on your part to actually cut the nails. Typically, smaller trimmers with short handles and dull blades will require more effort on your part to use while higher-end examples with extended handles and razor-sharp blades will be much easier. 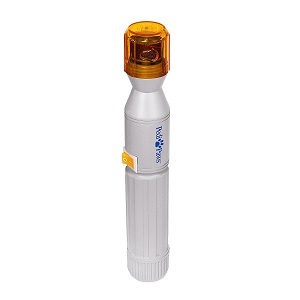 Almost always, electric power dog nail trimmers fall under the electric grinder category. 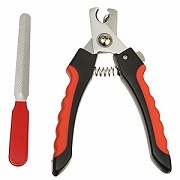 There are some exceptions such as some of the Miracle Corp nail clippers which utilize electric power for locating and centering purposes but the actual cutting motion is still done by you. With an electric grinder, you simply flip a switch or press a button and an electric motor will spin and grind wheel or another type of grind element and grind down the nail. The electrical source can either come from batteries or from an electrical outlet but we have found that most models either use batteries or have a battery that can be charged so that it doesn’t have to be plugged in the wall. This greatly helps with mobility and makes for one less cord that will get in the way of you and your dog. 1.5 What are the Different Types of Dog Nail Clippers?